Three weeks of frantic lantern making ended on Friday with a brilliant lantern parade on the Johnson Fold estate in Bolton. During the three weeks leading up to the event I worked with holiday clubs, Johnson Fold Primary School, a mums and tots group and the Youthopia Youth Club to create a multitude of lanterns. 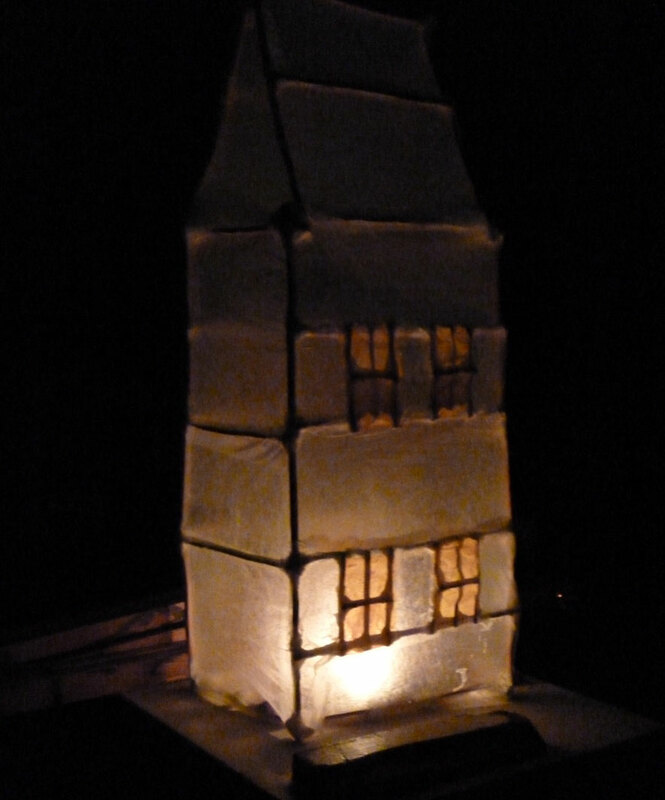 Most groups made the traditional pyramid lantern – we had almost 80 of these at the final count! Youthopia also created some large-scale lanterns – the only rule was that they must be small enough to get out the front door of the youth club! Everyone really got into it and worked really hard to make some amazing shapes and characters out of withies – we had a fish, a shark, a dress, some headphones and an ice-cream amongst others. I had to have a few late nights in the workshop (music as loud as you like once your neighbours have gone home – yippee!) tweaking, securing fastenings and adding LED tealights to get them all ready for the big day. I then had a tense couple of hours on Friday bringing the lanterms down on our (outdoor) hoist whilst the wind and rain raged but finally got them successfully delivered to Bolton At Home’s newly finished UCAN centre on the estate. Here’s some photos of the parade and the lanterns with the children and young people who made them.